Welcoming A New Work of Mercy! Editor: In his message for the World Day of Prayer for Care of Creation 2016, Pope Francis has proposed a new Work of Mercy for Christians to engage in: caring for our common home — the planet—and everything it embraces. And he has explained how we are to do it. “As a spiritual work of mercy, care for our common home calls for a ‘grateful contemplation of God’s world’ which ‘allows us to discover in each thing a teaching which God wishes to hand on to us,’” says Pope Francis. 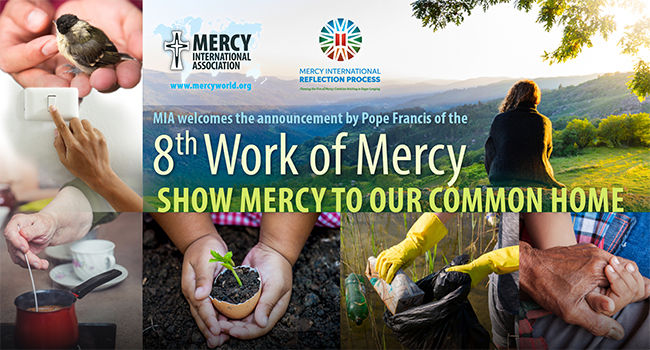 “As a corporal work of mercy, care for our common home requires ‘simple daily gestures which break with the logic of violence, exploitation and selfishness’ and ‘makes itself felt in every action that seeks to build a better world,’” he continues. Presented with this challenge, may each of us in this Year of Mercy grow in attentiveness to the divine everyday space we inhabit and to how we might reverence it.